One of The Wife's single friends. File photo by Howard. Lastnight I went over to a friend's house and spent an extremely pleasant evening. 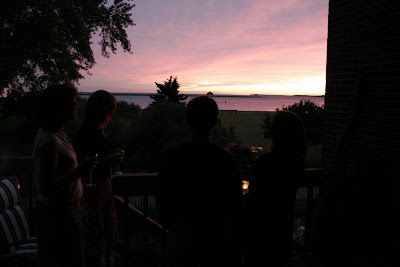 Four of us gals sat around drinking red wine, admiring the sunset, listening to sultry music by Johannes Brahms and discussing our past and present love lives and the love lives of people we know. And I got to pontificate freely on my knowledge of the Italian male psyche, as gleaned from the extensive time I spent with Leonard Pennario. 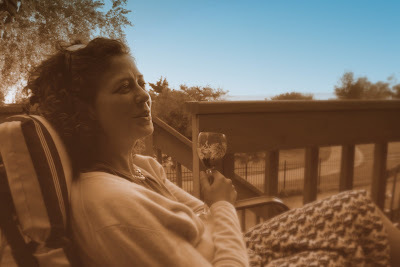 File photo by Howard of The Wife and her friends sitting around drinking red wine, admiring the sunset, listening to sultry music by Johannes Brahms and discussing their past and present love lives and the love lives of people they know. Pennario may have been 83 and the greatest piano virtuoso in the world but he was still a guy, I will tell you that. And he was still Italian, I will tell you that too. Not only that, but he was Sicilian. That is like Italian to the 10th power. Howard and I love to challenge the overreaches of modern political correctness and draw conclusions about people based on their nationalities. This kind of thing is absolutely verboten because of the increasingly intolerant nature of current political correctness but for my money it makes more sense than astrology. I am German so I love to beat the dead horse. I never give up on anything, no matter how hopeless or stupid the situation. The world will be collapsing around my ears and I will be sitting there saying, "Somewhere, somehow, there is the right thing to say, the right thing to do. If I could only just figure out what..."
Howard is German too and we joke about our penny-pinching tendencies. Because he is Jewish he has that double. We have an ethnic joke book from about 1910 I found at a garage sale and the German jokes and the Jewish jokes are interchangeable. They all have to do with tight-fistedness. Pennario being Italian I used to tease him about his romantic ways, including the way he pronounced things. "Leonard, say 'Modigliani,'" I used to say. "Say 'Cantelli.'" Even a short name like the conductor Guido Cantelli, Pennario could draw that out for all it was worth. But one thing I found myself thinking about yesterday was how being American influences us too. For some reason I had never thought much about that. My friend Alenka, whom I wrote about yesterday, was going on in that proper British way she has about how Americans can be so alien to her, how over here we're all so optimistic and enthusiastic. I started to murmur something about how we are not really all that different. But then five minutes later, I hear myself yapping: "This book about Leonard Pennario is just the greatest thing in the world for me! I just know it's going to work out great! I just know! I don't know HOW exactly, but I know it WILL. I just have this feeling...."
Mary of course you'll make it. Len knew from the day he met you. He knew you'd write his biography Leonard Pennario style. A romantic sees things in a different manner. His book will be written like no other biography has been published. You get the picture? You can call me anytime to bend my ear. About politically incorrect ethnic observations: I think James Joyce once wrote that the French national vice was Pride and the German vice was Lust (?? as in after power?). My fave is the one liner "A German joke is no laughing matter."